You know the saying “if you don’t have anything nice to day, don’t say anything at all”? Yea, that’s pretty much been me this week. After coming off of the high from last weekend, this week was just kind of…meh. We had an epic food battle with Rylee that spanned 4 different meals over 3 days all over food that she has always loved that she suddenly decided she didn’t like . Uh yea…not gonna fly in our house, kid. Long story short, and leaving out details that would get me judged by even the strictest of parents, those days? Sucked hard. And meal times and the time following? Were not fun at all. I took Rylee in to the Allergy specialist yesterday for some allergy testing. After playing outside on Saturday, she came in the house and almost instantly started sneezing, coughing and had a leaky nose. And, since we live right next to the county literally known as the “GRASS SEED CAPITOL OF THE WORLD!” allergies here are bad…really, really bad. 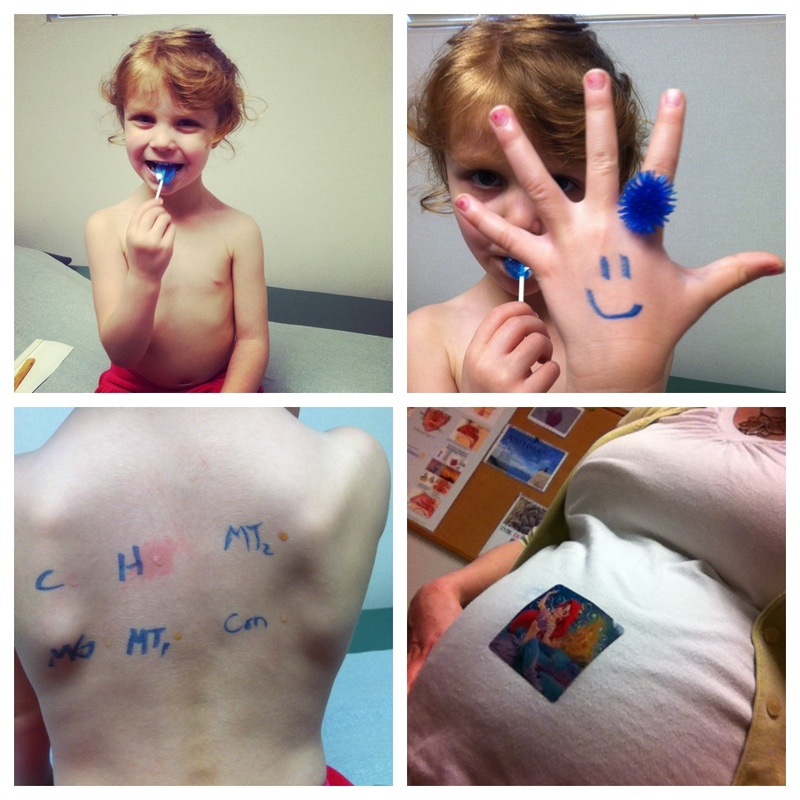 She was tested about 2 years ago and everything was fine then, but I wasn’t sure how often they recommend testing kiddos, so I went ahead and took her in. I tell you what, my kid is a trooper. She got a lollipop, a funky sea-urchin type ring and a sticker. She shared the sticker with her baby sister. And bonus! No allergies!! The doctor did say that all the pollen in the air can be an irritant, hence the allergy like symptoms, but Rylee does not have allergies. Thank goodness, because my allergies start to drive me crazy this time of year. After fighting all week with what I thought was a nutso allergy attack has turned into a cold. Last night I was miserable and ate a bowl of cereal for dinner. Today I’ve got a sinus headache that really needs to go fly a kite. On top of all that, work was kind of stressful this week and just well…not fun. But hey! It’s Friday! Rylee wants to have a family movie night picnic dinner in the living room tonight. We’re going to watch Balto. And yes, it’s even on VHS. Tomorrow our little family of three is headed to the coast and meeting my sister and her fiance. The weather is supposed to be pretty nice. The condo is on the beach. We may hit up the Marine Science Center. Rylee has requested we build a sand castle. There’s talk of fresh fish for dinner. Sunday is Earth Day…I’m thinking after we get home from the coast we may strike out on a walk along our road and pick up litter or something. A little exercise, a little good deed. Win-win, right? Long story short? I am so thankful today is Friday because I’m ready to have nice things to say again! This entry was posted in adventure, Discipline, family, montser on April 20, 2012 by katherine.